Three things happened this week that led up to the creation of this drink. 1 - We received a ubiquitous amount of cucumbers in our Lufa basket. 2 - A friend gave me a bag of Cool Cucumber flavoured David's Tea. 3 - Josh brought home a bottle of Hendrick's gin to celebrate the long weekend. 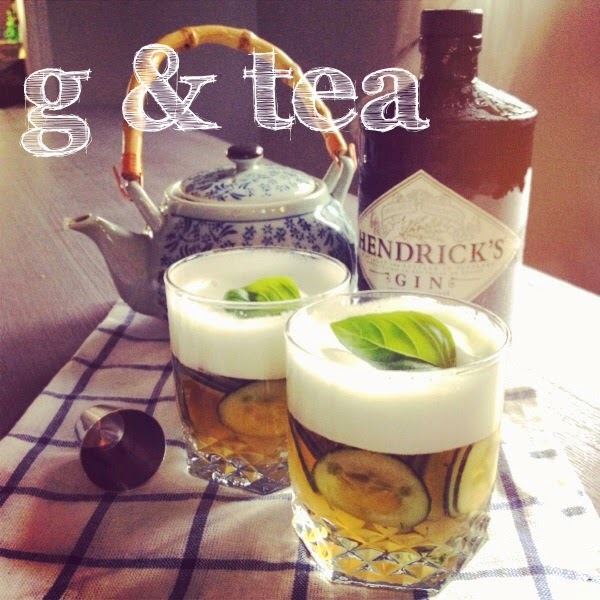 While chatting over a freshly brewed pot of the tea, we both concluded that it would pair marvellously with gin. I'm quite the novice at making cocktails (read: I've never actually made one), but I was inclined to test this one out - with a little help from the boy, of course. "Could you make a cucumber foam to go on top?" he asked, bright eyed. I wasn't quite sure what I'd do to make such a thing, but the first idea that came to mind was to use egg whites. Seeing as I've been mastering meringue techniques at school, I thought that this could would work out nicely. I opted to first test it out using a Swiss meringue, mostly because it's easy to prepare, but also because I find it to be a little less stiff than the Italian version. While Italian meringue holds well in a buttercream, I wanted something that would break up into foam once mixed into my drink. A juiced cucumber, three egg whites and a dash of sugar later, cucumber meringue was born. It broke down into a foam exactly as I'd hoped for. Even once it was stirred into the drink, a significant amount remained floating on top, creating a rather elegant presentation. To fancy it up even more, we mixed the leftover juicing pulp with a little bit of water to make cucumber ice cubes. Note: vegans / egg intolerant peeps: a little bit of frothed soy or almond milk would work in place of the meringue. Add a couple of drops of agave nectar to the tea, adjusting to your preferred level of sweetness. Steep tea in water for about 3 minutes. Remove tea leaves and refrigerate until cool. Juice one cucumber and set aside, reserving juice pulp. Mix juice pulp with about 1/4 cup water and divide among ice cube tray. Freeze. Meanwhile, over a bain marie, prepare egg whites, sugar and invert sugar. Heat, stirring continuously, until sugar is dissolved. Do NOT overheat, or your eggs will cook! Transfer to stand mixer fitted with whisk attachment. Whisk on medium speed until stiff peaks form (note: when beating egg whites, peaks are different than when beating cream. stiff egg whites are similar to medium peaks in whipped creams). Pour in cucumber juice and continue beating on medium-low speed. Stir gin into cooled tea. 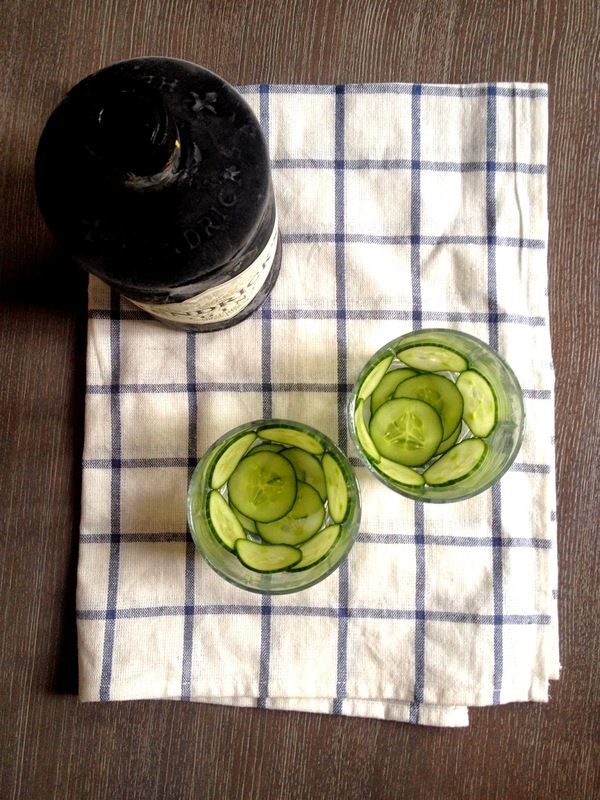 Assemble drinks: Thinly slice remaining cucumber, placing a few slices at the bottom of 4 glasses. 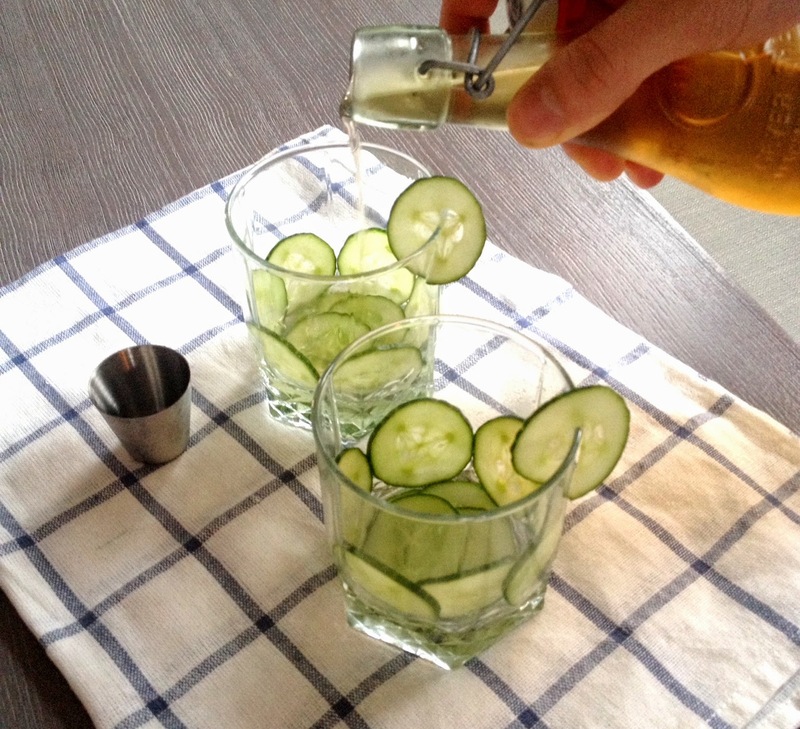 Add cucumber ice cubes. Pour tea & gin mixture on top, leaving 1/2 an inch for foam. Spoon meringue mixture into glasses and stir gently, until meringue breaks up into foam. Garnish with basil leaf, if desired.